Just a first look at the Pez Espada Hotel in Torremolinos reveals there’s a lot of history behind its walls. The facade has remained unchanged since it was opened in 1959, giving the starting signal to the promotion of the Costa del Sol as a touristic destination. On the outside, the hotel maintains that sixties halo that was so ground-breaking at the time and that now provokes the sensation of being in front of a temple of tourism, where the new and modern converge in a singular way. In the early sixties, Torremolinos was synonymous with modernity, distinction and entertainment. 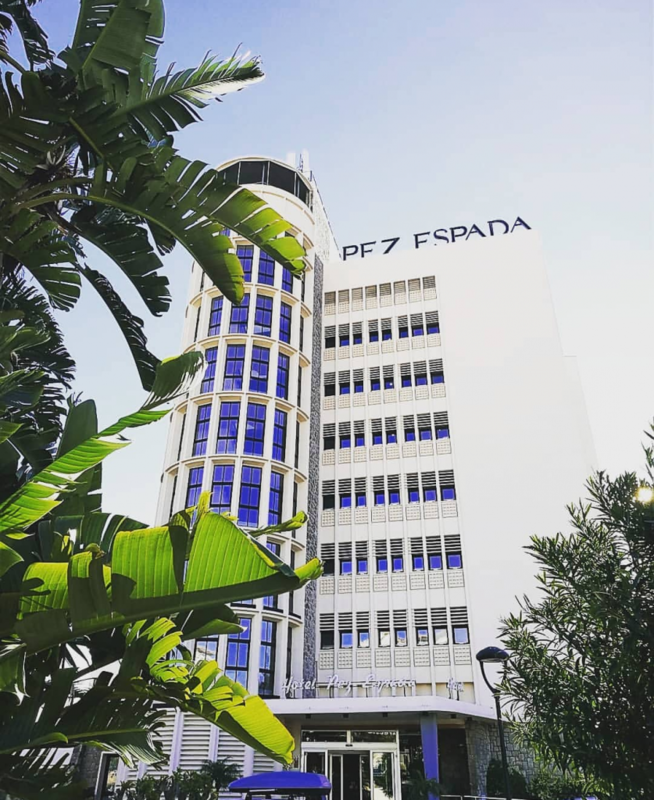 The Pez Espada Hotel marked the beginning of this fame, and according to many, also the creation of the Costa del Sol brand. Located in the heart of ‘La Carihuela’, once a fishing neighborhood, the hotel became a catwalk: princes and princesses, Hollywood actors, great singers, etc. Charlton Heston, Orson Welles, Anthony Quinn, Elisabeth Taylor or Ava Gadner were some of the most distinguished guests of the best hotel in Spain at that time. Frank Sinatra was probably who left a bigger memory, due to the small ‘incident’ he starred while he was shooting a movie in Malaga and that ended with the singer at the police station. Such an anecdote should be remembered, that’s why the hotel’s cafeteria has lined the walls with the singer’s records and is called Frankie’s Café. Many years of glory, parties and celebrities came later until the oil crisis in 1973 began to take its toll. After the recovery, other destinations like Marbella started to emerge and the hotel ended up closing, until 1986 when the MedPlaya Company bought it and opened throughout the year, helping to deseasonalise the Sunny Coast. This movement didn’t change the essence of the hotel; beyond the necessary renovations and refurbishment, the hotel retains its main characteristics: the building and its facade (included since 2006 in the Andalusian Historical-Artistic Heritage catalog), its imposing halls with marble columns and undulating floor and its beautiful staircase. If you feel curious and want to know more about this hotel full of history, just click here! 0 Comments on "Pez Espada Hotel, living history of the Sunny Coast"